Earliest documented appearance of SCP-3639, worn by the seated subject. Special Containment Procedures: The two separate components of SCP-3639 are to be held in separate standard containment lockers and available for testing with approval from the Level 3 Contact Researcher. No testing is to be performed. Monthly inspections are to be performed by Agents who have cleared Level-3 psychic resistance training. 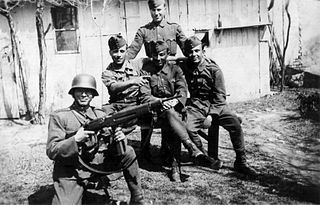 Description: SCP-3639 is a pair of boots of the type worn by members of the Hungarian Army during the Second World War. They display wear and tear typical of boots used in wartime, but are still largely intact. Tags and other manufacturers information have been worn off over time; however, the initials "K.L" have been branded into the inside of each heel. Actions taken by subjects wearing SCP-3639, hereafter designated as SCP-3639-1, will cause observers to rationalize any actions taken by SCP-3639-1. If pressed to intervene, observers will express ambivalence towards SCP-3639-1's actions, even if they find the actions to be abhorrent, frequently justifying their hesitance by citing some real or speculative equivalence between SCP-3639-1 and the objects or person(s) against which they take action. SCP-3639's anomaly also affects — albeit to a lesser extent — those who have not directly observed SCP-3639, but only received firsthand information about it. Such individuals will defend the actions taken by SCP-3639-1 less stridently, frequently seeking compromise or middle ground regardless of the severity of SCP-3639-1's behavior. Secondhand reports of SCP-3639's behavior do not appear to have any anomalous effect. This effect will persist even after subjects have been removed from the presence of SCP-3639, and will only cease when SCP-3639-1 removes SCP-3639; affected subjects can then be persuaded of the wrongness of SCP-3639-1's actions via reasoned argument and, in extremis, amnestic therapy. History: Manufacturers records relating to SCP-3639 were destroyed during wartime. Historical documents recovered after the fall of the Soviet Union indicate that the Red Army first encountered SCP-3639 in the possession of a Hungarian soldier, SCP-3639-1, who had taken possession of a small village on the outskirts of Budapest. GRU-P commissars were able to identify SCP-3639's anomalous properties, and were able to terminate SCP-3639-1 from a distance. After testing for potential political uses, they were determined to be too volatile and placed into storage. The Foundation was able to take possession of SCP-3639 in September of 1995, as part of an agreement with the Russian Federation. Addendum 3639-A: Testing Log Records. Testing of SCP-3639 was initiated by Site-30 personnel after request by Researcher David Bolland, who had been recently promoted from Junior status. It was the first project undertaken by this research team. Procedure: D-0127 was instructed to place SCP-3639 on their feet, then destroy a glass jar while being observed by D-0412 inside of a viewing room. Results: D-0412 wrote afterwards of the dangers of glass and how the actions taken by D-0127 made them feel safer. Procedure: D-0127 was instructed to take physical action against D-0412, who would be debriefed following the test. Test duration was one hour. Results: D-0127 initially took minor actions against D-0412, pushing and shoving them to the ground. As the testing period progressed, D-0127 became more violent, eventually rendering D-0412 unfit for future testing. Debriefing is pending. Procedure: D-0127 was instructed to attempt a logic puzzle while wearing SCP-3639. Results: D-0127 did not attempt to solve the puzzle, instead berating the personnel conducting the test. Test was terminated after 45 minutes. Procedure: Researchers cleared for engagement were encouraged to interact with D-0127 in order to prevent the need for additional test subjects, while also documenting their interactions to examine SCP-3639's effect in a conversational environment. Results: D-0127 agreed to continue as a testing subject, in exchange for additional accommodations. Research personnel noted that D-0127 did not make unreasonable demands, despite their disposition. Procedure: D-0127 was placed in a standard living chamber, with a sealed door between them and double food rations. Materials to remove the door were placed in their presence. Results: D-0127 destroyed the door in a violent fashion, ignoring the keycard and other nondestructive tools placed at their disposal. Addendum 3639-B: Following the completion of the testing battery, SCP-3639-1 had been given full access to the Site-30 facility, living in the quarters of Researcher Bolland's team. A critical mass of personnel on-site had become affected by SCP-3639, forming a shadow chain of authority on-site. SCP-3639-1 used this influence to disrupt on-site activities for their personal gain. Several days after this state of affairs came to be, off-site communication analysts noticed aberrations in Site-30's reports. SCP-3639-1 had instructed the falsification and misrepresentation of on-site activities, which eventually led to noticeable inconsistency. At this point, Foundation agents began investigating and quickly contacted unaffected members of the site, who provided intelligence revealing the scope of SCP-3639's influence over Site-30. MTF Eta-10 was deployed, and were able to recover SCP-3639 and terminate SCP-3639-1 via long-distance firearms. All personnel affected by SCP-3639 were given amnestic treatment and therapy, while all other personnel were reassigned. Site-30 was reorganized due to this critical failure having destroyed morale and the capacity for research or containment in its present state. Agent Hikks: Start from the beginning. I know this is a stressful time for you, and I can promise that I'm not going to drop you out of your chair if you think I might not like your answer. You were testing with the D-Class. At what point do you think the experiment began to go out of hand? Rsr. Bolland: It was… our first project. My first project, leading a science team. We'd all passed our psych evals, which maybe could've maybe been the problem. We all knew, in our heads, the danger was there, but there was some kind of a safety bubble. We were ready, couldn't happen to us. There wasn't anything particularly dangerous about a pair of suggestive boots, we thought. Agent Hikks: What was your process for choosing D-0127, specifically, among the D-Class available to you? The files I've read indicated that you had only a few candidates to choose from. Give me your thought process, especially considering this was something entirely new to you and your team. Rsr. Bolland: We thought the non-violent personality wouldn't offer problems. That could have, uh, contributed to us letting our guard down. The only thing ever recorded on their file was talking back to a guard in mess hall for their attitude. Did we not take them seriously enough? I thought it would help us, to do the best with what we had. Agent Hikks: Not taking them seriously enough might have been a possibility, in my estimation. The records I have in front of me show you complained there were 'slim pickings' in your personnel reports. Any resentment towards administration there? They did rebuke you for the language choices you made there. Agent Hikks: Let's stick to what we're here for. You're not exactly a prime candidate to show that the youth movement can tackle big projects straight out of the gate. Catastrophe happened here. Things seemed to have escalated quickly. Rsr. Bolland: The experiments began as normal. We went through the baseline testing, then moved on to the stickier stuff. I think, maybe, it started to go downhill in the second battery of testing. That was when we started talking to [REDACTED]… er, to D-0127. About things… other than testing. Agent Hikks: Focus. It didn't seem to take long to go from talking to sympathizing with the D-Class, did it? Your team members said you took the lead on inquiring outside of the approved topics. What were your early conversations like, the ones that occurred in the test chamber? Rsr. Bolland: I wouldn't say I was the first to start talking, but D-0127 was more responsive to me more than the others. He had a real sob story. From Milwaukee, grew up in Ohio, he said. My dad came from there. I think our first real conversation was about how the river caught on fire, that time in the '70s. Claimed he was just a drifter caught in the wrong place at the wrong time. Said the only good thing about being with us was that we got him off meth. Agent Hikks: So pity turned into obedience? You think oh, this person shares some culture with me, maybe they shouldn't be where they're at? Maybe they have some good ideas? How did that continued escalation happen? Rsr. Bolland: The turning point was letting [REDACTED] out of the D-Class areas. Letting D-0127 out. When the Deputy Director got involved and turned like… us, thinking like us, pretty quickly. When there was a higher up making it seem okay. It was just… easier. To think of some justification for why we did what we were doing. To go from privileges, to providing. There always seemed to be a good reason in our heads. Agent Hikks: Was the exposure of the Deputy Director a deliberate action, or a consequence of something else? There seemed to be dramatic uptick in the situation once he got involved with the experiment, if you could even still call it an experiment at that point. Rsr. Bolland: I think he might have been trying to intervene. Pretty early on, it seemed, there was suspicion that something was not right. But either there was some improper following of protocol, or something else that just went wrong. But when he came to our test area, I think, there was some direct engagement with the subject. He was the first outside our group to come under [REDACTED]'s influence. Agent Hikks: You and your team are more or less patient zero in this fiasco. Did it take long for a critical mass of your coworkers to become affected? Rsr. Bolland: Not a lot of people actually even saw [REDACTED]. A few higher-ups, us, and then if anyone came to close asking questions they were pretty quick to not ask tons more once they had a chat with him. I remember on the first day, there were a lot of conversations and murmuring but that was the extent of any reaction I saw. I could see in people's eyes when they looked at me, they had questions, but there was… fear too, of what would happen if they asked them. Agent Hikks: I reviewed memoranda you sent out to your colleagues. It seems you were focused more on reassuring them that everything was normal than anything else. Talking a lot about an imminent return to normalcy and how things really weren't that different than they had been before. Rsr. Bolland: Not just me. That was the key to the whole game, in [REDACTED]'s eyes. This was all being improvised. We weren't being mind-controlled. When we did what he wanted… the more we did, the easier it was to justify what what we'd done. Precedent, you see? Everyone else seemed to be moving with the program, so we kept going, and the tension ratcheted up another notch. It wasn't normal. Agent Hikks: If people didn't feel it was normal, why wouldn't they leave, or revolt, or tell someone off-site? There can't have been that many people comfortable with a D-Class still in their jumpsuit calling the shots in a fairly obvious way. Agent Hikks: Hey, stay focused. I know you were pretty isolated after a certain point, but what were people saying? Did they talk about escaping, cooperating, organizing to fight back? Rsr. Bolland: Sorry. After the first day not a lot of people talked to me. Maybe they thought I wasn't… someone they could talk to. I saw a lot of people keeping their heads down. Agent Hikks: You have a unique perspective, from your place at the very start of all this. Can you give any information about how this spread? Was it maybe a viral thing, or a more social phenomenon? Rsr. Bolland: I didn't know exactly how many people were affected, and I don't think anyone else did either. A giant prisoner's dilemma. Nobody had experience with a breach like this. You expect these things to be sudden, and this was sudden, but in a different, insidious way. No blood and guts and twisted metal. Instead, handwritten orders from your boss asking how that birdhouse you were working on was coming along and oh, by the way, can you fudge the truth on behalf of [REDACTED] - and remember, essentially we'd been treating him as if he wasn't human. To us, the day before, he'd been basically a slave. Agent Hikks: Did D-0127 say anything to you directly, once he had effective control of the facilities? You were doing a lot for him in writing the memorandum telling your fellows to get with the program. Was there anything you got promised in return for this collaboration? Rsr. Bolland: After the testing, the flattery, the sympathy… not a lot. I guess once he was done with me I wasn't really a part of his life anymore. In my head, I justified it as really helping a person, that maybe it wasn't so bad. There were so many injustices we had done to him, to [REDACTED], I couldn't really see anything he was doing to us as really being that awful. Nobody was being lined up to get shot at the end of the month, or… whatever happens.You know, sometimes, what we do to them, the D-Class? It can be a fate worse than death. Agent Hikks: You're still sympathizing, then. Anyone can spin a sob story, you know. None of what D-0127 said to you is definitive truth. Do you still have these feelings about D-Class, or D-0127 specifically? Rsr. Bolland: I'm still thinking about it. I'm not 100% sure where my thoughts end and those boots begin. Can we take a break? Agent Hikks: I think we've got everything that will be productive here. We'll contact you for the next follow-up soon… I'm sure you'll have plenty of time to speak with us.